Climb the rugged terrain of logs, boulders and trees as you go for the ride of your life on the Log Jammer! At 27' tall, this slide can be used wet or dry, has a netted jumping area beneath the giant slide and will accommodate kids as well as adults. Sliding bags are included. Size: 65' L x 18' W x 27' H.
OHIO requires STATE inspection and additional fees. 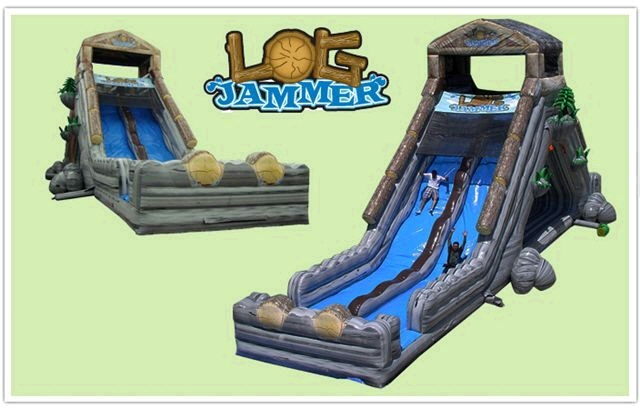 * Please call us for any questions on our slide logjammer w/bounce 18x65x27 foot tall rentals in Ft. Wayne IN, Warsaw, Syracuse, Auburn, South Bend, Indianapolis IN.